When the Cal women’s gymnastics team traveled to Fort Worth, Texas, last Friday, it knew it was stepping into unfamiliar territory — territory the Bears haven’t touched since 1992, the last time they qualified for the NCAA Championships. In the end, Cal fell short of making it to the Super Six Team final, but this didn’t stop them from making history. The Bears ended the prestigious tournament in seventh place, their best ever finish. Cal began the night on beam, its most improved event of the season. Freshman Sofie Seilnacht got the team out to a strong start, finishing with a 9.8875 as the first one up on the event. The Bears also got great performances from juniors Charlie Owens and Desiree Palomares, each finishing with a 9.8375. In the end, Cal finished its first event with a 49.075, its strongest event score of the day. “That lead off spot really sets the tone for everybody else, so for Sophie to get on and rock a beautiful beam routine really inspired everyone,” Howell said. But this high didn’t last long, as the Bears ran into trouble on their second event, floor. 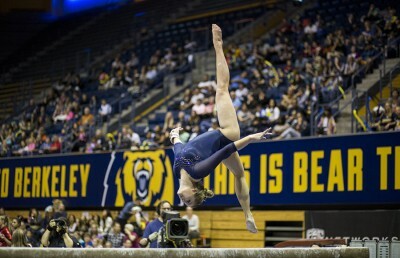 Cal entered this tournament with floor as its best event, but its score was not representative of that. The only strong floor performances came from upperclassmen, juniors Zoe Draghi and Jessica Howe. 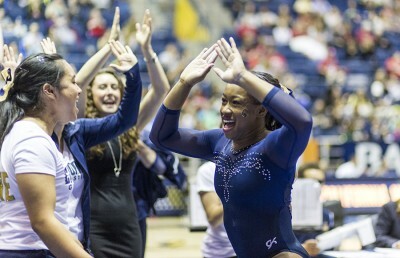 Both of them finished with a 9.800, leading the Bears to a team floor score of 48.875. 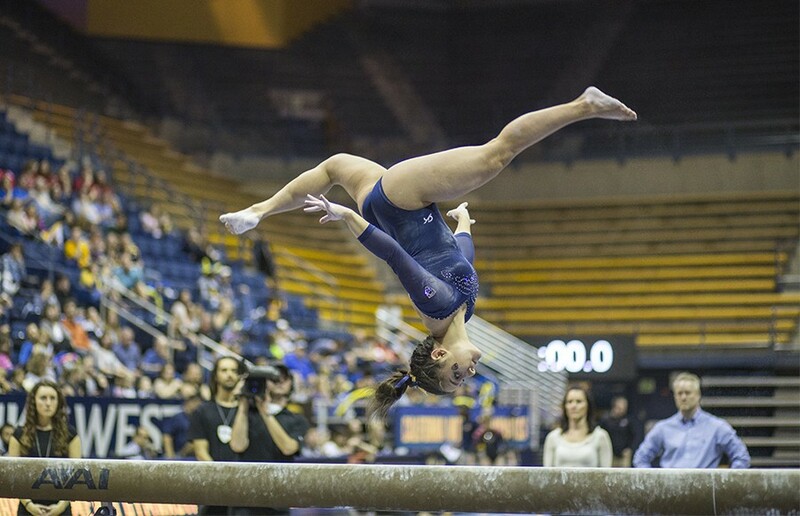 Luckily, Cal brought back some of its energy on its third event, vault. Freshman Sylvie Seilnacht brought the Bears back on vault, being rewarded with a 9.8375 after sticking her landing. Palomares brought back her energy from the first event, finishing with the next best score at 9.8250. And rounding it out was a 9.8125, put up by three different Bears. This included sophomores Alicia Gallarzo and Arianna Robinson, along with junior Emily Richardson. In the end, the Bears finished with an overall vault score of 49.000. The Bears closed out their historic night on bars, knowing they needed a season-high type of performance in order to make it into the final. Cal entered vault with an overall score of 146.950, just behind UCLA’s 147.7125. The next two teams on top were first place Oklahoma with a 148.3125 and second place Alabama at 147.900. Richardson, as the first one up on the event, responded to the pressure in spectacular fashion. She earned herself an overall bars score of 9.850, which was the second best individual score of the day for Cal. Gallarzo stepped up as well by finishing with a 9.8125. And Sofie Seilnacht notched an overall score of 9.800, contributing to the Bears overall event score of 49.000. All of this, however, just wasn’t enough for the Bears to move on. The Bruins’ lead heading into their final event was enough to hold off Cal. UCLA ended the day with an overall tournament score of 196.700 after putting up a vault score of 48.9875. This was just above the Bear’s final score of 195.950, good enough for seventh place. Still, the fact that the Bears qualified for this tournament in the first place must be considered a victory. And finishing a spot above its eighth-place finish 24 years ago makes it even sweeter.